Many new children come to Raise the Roof Academy in Uganda hoping to be registered and included. When we register a new child; however, it often takes months before we are able to find a sponsor for that child. Your gift will help to provide meals, school supplies and other necessities for a child who is waiting to be sponsored. Your sponsorship of $35 each month will provide a school uniform, meals, shoes, school supplies and pay fees so your child can receive an education for a promising future. You can develop a meaningful, lasting relationship through letters written and received from your sponsored child! Your sponsorship will provide life-saving preventive measures, basic health care, awareness workshops on preventing disease, safe water, education and comfort to children and families who are suffering. Your support will save lives. We met Charles, Moses, Ivan, Tony, and Ronald in 2010. They are brothers and cousins, all cared for by their Grandma Resty. Their parents died of HIV/AIDS a few years ago, which left Grandma Resty in a difficult position. Now, 5 years later, all five boys have a sponsor! They are all in school, have access to clean water, and have suitable clothing for school. Most of our Raise the Roof Academy children walk between 2-4 miles per day to attend school. A school bag helps tremendously on their journey. Many children do not even own a single pair of shoes and walk back and forth to school barefoot in the rain and heat. This leads to jiggers which wreak havoc on their little feet. For $22 you can provide a child with a sturdy pair of shoes. Having a second outfit for the children to change into for activities and sports helps to preserve their school uniforms and makes playtime more comfortable. For $20 you can provide a t-shirt and shorts. 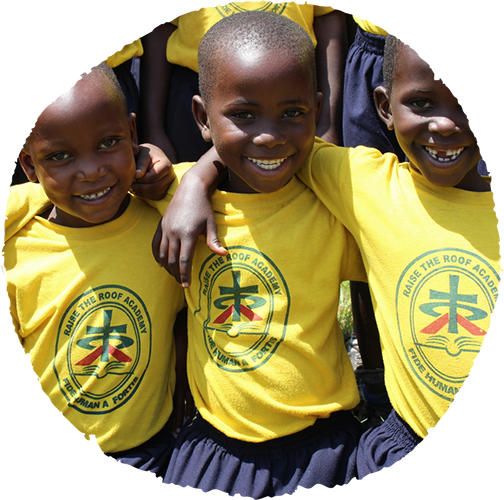 Every sponsored child at Raise the Roof Academy is provided with a new school uniform and shoes when they first begin. However, for most of our children this is one of two outfits they own and gets worn out quickly. For a gift of $60 you can provide a child with a new school uniform and shoes. In Africa, education is the difference between child labor and freedom to be creative. Meet the RTRA Grade 6 students! 6 years ago, with hope and a promise, this group of students embarked on a journey to achieve their dreams- to become teachers, doctors, lawyers, pilots, nurses, and pastors; leaders who will change Uganda. With humble beginnings in a shack we have all come so far! We now see what can be. Child and Sponsor relationships matter! Roofs are being raised! Your building fund donations this past year have allowed for the continued growth of the school campus. What a blessing to be able to welcome more children and continue advancing each grade level. The majority of children living in rural Uganda are sleeping on dirt floors in mud shelters. They are susceptible to the elements and all kinds of creeping creatures that carry diseases. The sleeping kit is a foam mattress, mosquito net, and a blanket that can make a tremendous difference for the children’s health and well-being. The bunk bed is space efficient for multiple children, providing a better night’s sleep for them. A metal storage unit helps a family keep their clothes, school supplies, tools and cooking pans locked and secure. We’re grateful for the water well that was installed in 2012. However, the purified water does not stay clean when it is collected and stored in bacteria-ridden jerricans, thus continuing the cycle of waterborne illness. A gift of $20 can help provide families with clean storage containers which help maintain safe water for cooking and drinking needs. Proper hygiene is the most important and basic need for fighting preventable diseases. Many of the caregivers do not have the means to purchase soap and toothpaste. For only $15, you can provide a child with a wash basin, bar of soap, toothbrush, toothpaste and a wash cloth. In Africa, education is the difference between death and disease or life and health. A child who does not have good medical care will struggle to break the cycle of poverty. With limited access to hospitals and clinics, something as simple as a broken bone or a respiratory disease can mean a lifetime of struggles. At Raise the Roof Academy, we now have a full-time nurse and a basic clinic. Fight illnesses including malaria, pneumonia, and diarrhea- three of the leading killers of children in poverty. Your gift will help support the full-time nurse and medical clinic in treating illnesses, burns, broken bones, and other accidental injuries, as well as provide necessary medications that enable children to lead full and active lives. A dairy goat can supply a family with several quarts of nutritious milk a day. Extra milk can be sold, families learn to use goat manure to fertilize gardens, and because goats often have 2 or 3 kids a year, they can earn more income. Each pig provides a valuable source of protein, income from the sale of offspring, and natural fertilizer to nourish crops and soil. Pigs need little land and can thrive on crop and garden byproduct scraps. 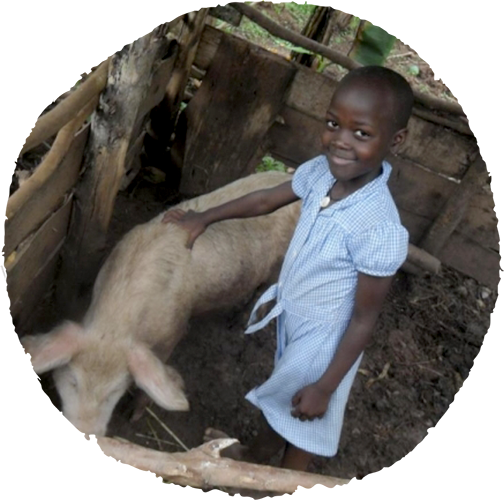 An average sow can provide up to 16 piglets a year, many more families will soon benefit as your gift is passed on. Farm2Feed is our new agribusiness program created to establish a community garden for the feeding program and to provide vocational training in farming and agribusiness to older students. We would like to purchase an additional 20 acres, livestock, seed, farming tools and eventually hire a farm manager. The village women chose to call their circle, Tusituke; in Luganda this means, let us rise up, and the women are doing just that. We now have two sewing machines that have been donated and are being utilized by the Tusituke Women’s Sewing Entrepreneurship Program. This is so empowering for the women and reduces our uniform expenses by being able to make in-house. We take pride in the ability to serve breakfast and lunch to all of the children and staff 5 days a week at Raise the Roof Academy. Unfortunately, due to poverty, many of the children are under nourished and need supplemental nutrition. We are in the process of developing our feeding program further to ensure all children are being fed appropriately while attending school. Your gift will go towards the food and preparations for the children’s meals. Raise the Roof Academy has been expanding and we are in need of more desks to seat all of the children comfortably in all of the classrooms. Raise the Roof Academy is growing! The community has been blessed by the presence of the school and we have a long waiting list of children who we do not currently have space for. We are committed to continually building and developing the rooms and resources we are entrusted with. The children were thrilled to try out their new playground for the first time! For most of our students, this was the first time on a swing! Help us work toward our future to build more classrooms, dormitories and a secondary school! Leave a lasting legacy with your gift of a classroom. Water is fundamental to life. Thus, no one can be lifted out of extreme poverty without adequate access to water and sanitation. The installation of a rainwater harvesting system will provide greater sustainability, conservation and efficiency. The water catchment system includes a 10,000 gallon corrugated galvanized steel tank, rain gutters installed on all of the classrooms, spouts, filters, tubes, pump and concrete pad. We would like to acquire land, clear and level it and plant grass for a sports field that will have soccer posts and nets. Netball is the female sport of Uganda and is played on a hard court (like basketball). Since soccer is considered a male sport, we would like to provide the girls with their own netball court. RAISE THE ROOF ACADEMY IS DEDICATED TO BEING GOOD STEWARDS OF ALL DONATIONS. 100% OF YOUR MONEY GOES TO THE PROJECT YOU SPECIFY. Your gift to “where most needed” or a general donation without a specified project, equips Raise the Roof Academy to balance all resources—including personnel, materials, supporting services, buildings, and equipment—to fulfill our mission. Your gift will enable us to respond quickly in areas of greatest need to help Uganda’s most vulnerable children and families. When you give through the catalog, we can send personalized honor or memory cards directly to your family and friends. Please submit honor or memory name and address with your payment.